"Nutrition For Your Body Mind & Spirit"
2.) I was always tired and never could lose the weight, especially around my hips and waist. Since I began your healthy suggestions I have not only lost weight and inches I have tremendous energy. My family doesn't recognize me. I am a new ME! I continually listen to the CD in my car on the way to work, this encourages me to take care of me. Its like having you privately coach me. 4.)Dr. Sorai Stuart's nutritional lifestyle program is for people who are committed to their health ... not just to healthy looks or vanity. If you adhere to her diet recommendations-- and her program which includes the best food by food, specific program I have encountered, your health too will be improved at the deepest levels: from cell to cell molecular integrity, to digestion and nutrition absorption, to immunity, muscular strength and energy! When I happened upon Dr. Stuart's program I was frustrated by two year's worth of following exercise and diet regimens that netted only moderate results, a poor return on a good deal of physical effort and constant vigilance over what I ate. Even with my best efforts I continued to be plagued by migraine headaches, intermittent bloating and gas, allergies, congestion, and a roadblock against any further weight loss (despite still being 20 pounds heavier than my ideal body weight). Within days of following her dietary guidelines I was no longer congested, my sinuses cleared, elimination became regular and healthy, and my allergies disappeared. Within two weeks I saw continued increases in my energy levels and steady and painless weight loss. Best of all, my protruding abdomen, which was a source of embarrassment for me (I even had a co-worker ask me if I was pregnant once) is gone! As long as I don't deviate from the "Stuart" program I am migraine free and allergy free. Instead of buying myriad's of vitamins and supplements (even the best of which are synthetically produced and not that good for you) I am buying organic, raw vegetables and whole grains and eating and enjoying a wider variety of foods than ever before. The famish / hunger that I lived with on a daily basis is gone. I am deeply grateful for the information in Dr. Stuart's program. It was the missing piece in my quest for optimal health. I was compelled to embark on the quest two years ago when my body signaled it was suffering from my neglect of it and I ended up with some serious health concerns. Now that I am feeding it properly, my body is acknowledging my care of it by giving me a daily sense of well-being and a joyous feeling of vitality. 5.) I had a number of health problems for her to deal with. First of all, I have no thyroid. By following Nutrition For Your Body Mind & Spirit, I can now control my weight and I am always aware of what I am putting into my body and how it will effect the way that I feel. I am truly grateful for meeting Dr. Stuart. She is truly talented and I would highly recommend her and her book to anyone. Kudos to her for helping not just me for wanting to help everyone become aware of how what you eat can really affect the rest of our lives. 6.) 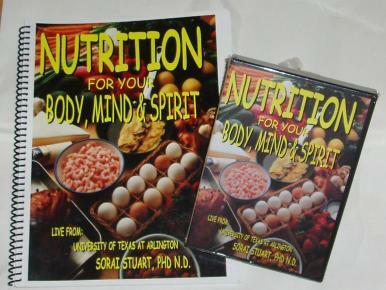 Dr. Stuart's book, Nutriton For Your Body, Mind & Spirit,is a wealth of information. If we would all abide by what she has compiled, we'd be healthy at any age.